It is our mission to provide to you the very best portal experience possible for your SMF forum. Our TinyPortal staff is made up of volunteers who are always ready to give you free support and advice on your TinyPortal installation and all of it's features. TinyPortal is a mod for Simple Machines Forum (SMF) that adds a powerful and mature Portal to your SMF Forum in minutes, with native integration, without having to worry about bridging, database, and appearance. Your SMF and TP will be a homogenous ensemble from installation. It's up to you and your creativity to use TP's features to customize your site and organize its content. Please Note: For TinyPortal version 1.5.0 and later, the minimum required PHP version is 5.4. 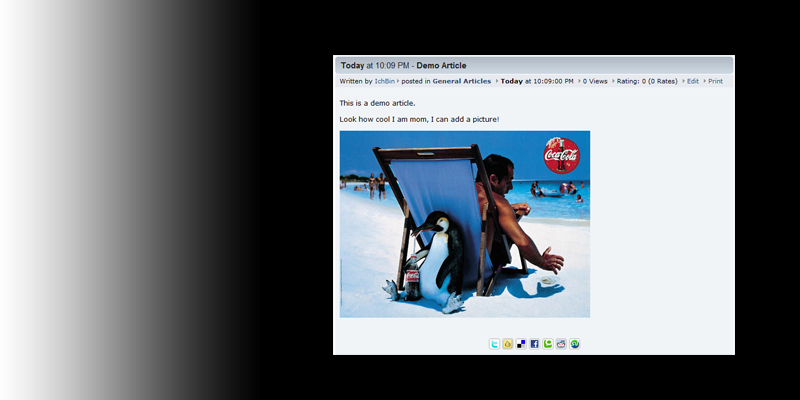 Article System: The article system gives you a CMS system tightly integrated with your forum. No need for bridges, double registering or other kludgey interface schemes with complex CMS software. Write articles in php, html or bbcode, and choose what member-groups can access them, who can contribute, and how they are approved. Choose the inbuilt menu options for these pages, or write your own, the flexibility to accommodate your choices is built in. Blocks: Blocks is a term for the rectangles of information you can use throughout the portal. For the sake of simplicity the page has been divided into the "panels", which when combined can mimic many common page layouts. These blocks can contain regular html, php code or special written functions that collect specific types of information. You can show them according to which permissions the visitor has, and even show them just in certain sections. You will come to love playing with them. 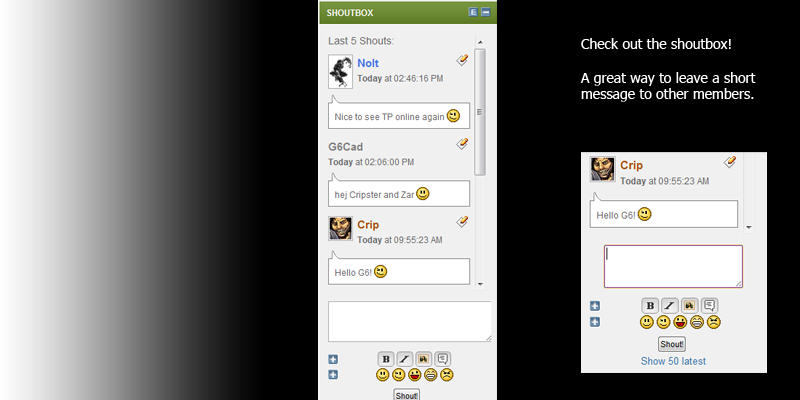 ShoutBox - Its a box in which you can leave messages for others to see and thus maintain a simple "chat" on the site. Combined with permissions you will have much freedom in who can participate as well. And as your visitors will discover, its actually quite fun to leave a smiley or two in it. Recent Posts - Showing the recent posts in a small sidebar, and letting members know what is new and unread, encourages participation and will boost member satisfaction. Theme switcher - Let members and visitors choose their favorite theme. Search - Allows members to search your site for content. 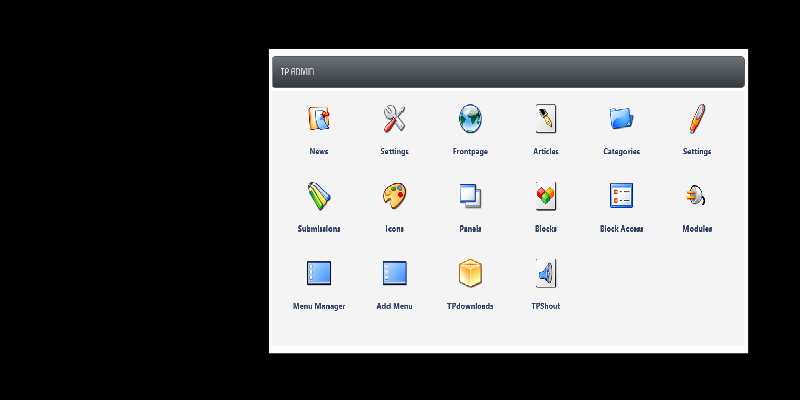 Other blocks include: Top Posters, Calendar, RSS feeds, Menu (Managed in the menu manager), User Profile block, and News. And since you can use php, html and BBC, the only limit is your imagination. 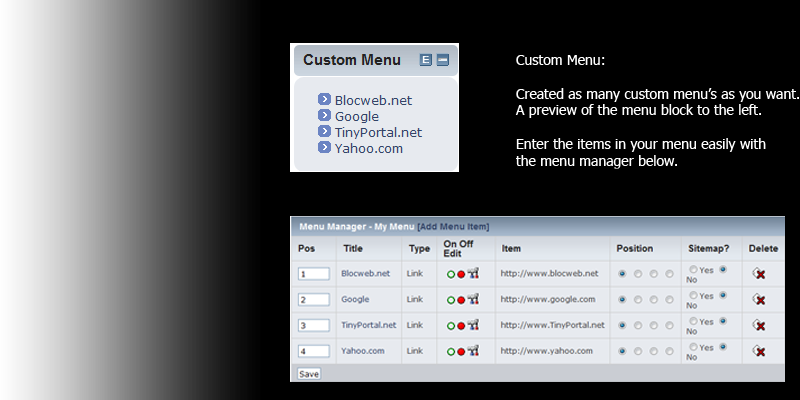 Menu Manager: A built in menu manager allows you to create multiple menu's. These menu's are displayed in a block. You get all the features of blocks to display these menu's in different places along with choosing who gets to see the blocks based on permissions. You can create different types of links: links to articles, categories, or even just a custom link. You can choose to have the link open in the current window or a new window. Downloads Manager: A built-in module for TP that lets you offer files for your members to browse and download. Its works by having the downloadable files placed in categories. These categories have permissions on them, letting you restrict member groups access level per each category. Allow members to upload files, controlling which member groups are allowed. Below is a small sample of the blocks built in to TinyPortal, and ready to use. The rest is up to you. Please don't ask for support in this shoutbox, start a topic in the forum, thank you. Evening all. Almost like spring today. Lovely. Evening Ramón. Was just looking at your site. Nice job. Hi Oldiesmann welcome back to the land of TinyPortal. Morning all. Nice to See SMF 2.1 RC2 released. More testing eh. Yo Mick, glad you like it. I'm sure you'll soon find your way around all the changes. Dude!, I just upgraded my dev site to SMF RC-1 and loaded TP. TP really have come long ways. Im learning to use it and There's a good chance imma use it on my live site when I upgrade. You guys rock! Great to TP Still kickin em goals!! Welcome to the TinyPortal Support site. Ready to install TinyPortal and need some direction? Check out our Docs Site where you can find a number of helpful articles and information to help you work through any issues that you might face. Of course, you can always post to the Support Boards to ask any question that you have. Please be sure to read our Posting Guidelines. If you have any questions, please feel free to ask in our TinyPortal Support forum. Page created in 0.305 seconds with 29 queries.